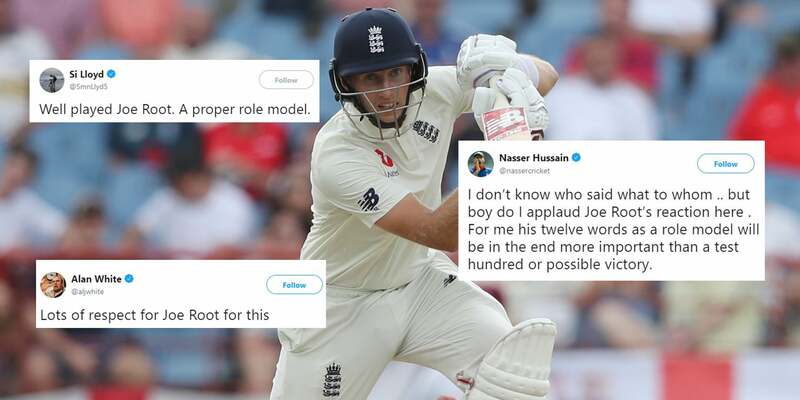 The England cricket captain Joe Root has won praise after speaking out against a West Indies bowler who appeared to use homophobic slur during an on-field incident on Monday. Footage shows Root responding to something inaudible that West Indies fast bowler Shannon Gabriel said to the batsman after bowling a ball. Although TV cameras didn’t pick up what Gabriel said, Sky Sports were able to pick up Root’s reply and provide subtitles. Don’t use it as an insult. There is nothing wrong with being gay. Press Association Sport have reported that Gabriel, who is from Trinidad and Tobago, was warned by umpires about his language on the pitch. Sometimes people say things on the field that they might regret, but they should stay on the field. He’s a a good guy who plays hard cricket and is proud to be in the position he is. The battle was a good contest. He’s had a wonderful series and he should be proud. Root added that he didn’t want to add anything else to what was said between the two as he would rather it ‘stay on the field’. The footage of Root’s retort has since gone viral on social media and fans and sports professionals alike have been quick to praise the 28-year-old’s words. I don’t care for cricket, but nice one Joe Root. Joe Root seemed to respond to Shannon Gabriel saying “there’s nothing wrong with being gay”. This is good leadership from Root. Windies should be investigating what Gabriel said. If it was a racist remark he’d be disciplined.